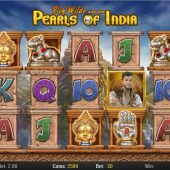 Pearls of India slot is a Play'n Go-built game, joining many other popular titles in their catalogue such as Book of Dead, Cloud Quest and Moon Princess. This particular edition is the follow up to the particularly successful Aztecs Idols, where Rich Wilde seeks out hidden treasures in a mystical ancient land. This slot has 5 reel, 3 row game with a total 20 paylines. The wild symbol is the main character - Rich Wilde appearing only on 2, 3 and 4. The scatter is the Pearl symbol, with the bonus symbol showing as the ancient temple. Accompanying the reels is a multiplier chart on the right-hand side. This can accumulate as wins start to come in, with up to 10x available on a single spin in the base game. 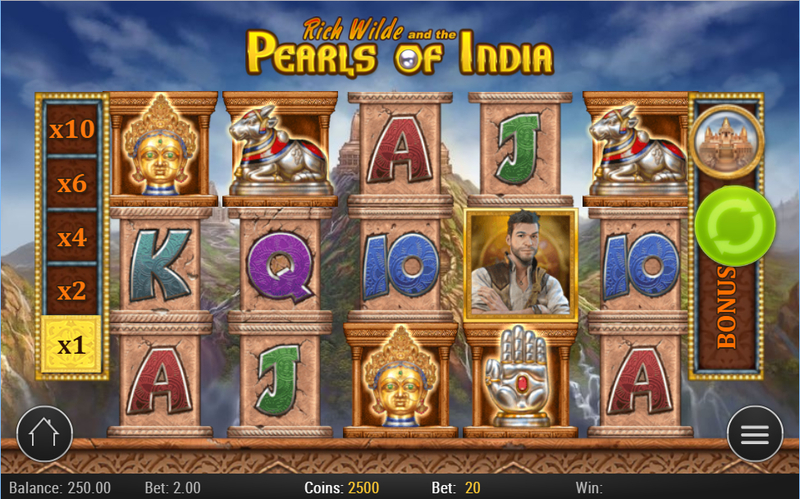 As you might expect, Peals of India has a free spins feature. This is triggered by landing 3 Pearl scatter symbols on the middle 3 reels, giving you 10 free spins. This free spins feature starts with a multiplier of either 1x, 2x, 4x, 6x and 10x and gets better from there. Your best potential is 30 free spins with a possible 50x multiplier, which can be pretty tasty is you can achieve it!